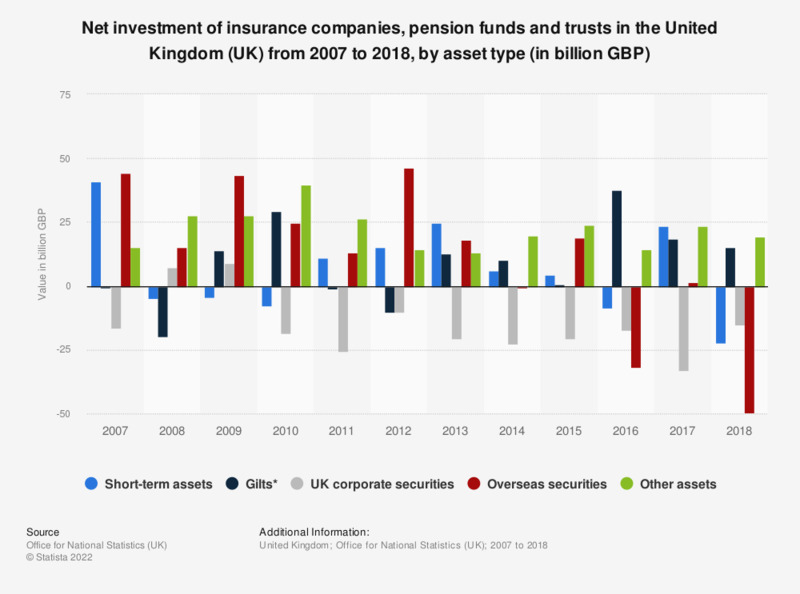 This statistic illustrates the value of net investments made by insurance companies, pension funds and trusts in the United Kingdom (UK) from 2007 to 2017. It can be seen that the net investments in short-term assets fluctuated during the period under observation, reaching a value of 32.2 billion British pounds (GBP) as of 2017. Total net investments amounted to approximately 92.1 billion British pounds (GBP) at that time. * Gilts are the UK government sterling securities. The source adds following information: "This release contains net investment data arising from financial transactions: investments and disinvestments made by these institutional groups".